The entrance to Fort Bliss in Texas. Photo by Joe Raedle/Getty Images. On Monday, Secretary of Defense James Mattis announced that migrant detainees would be housed at two U.S. military bases: Goodfellow Air Force Base and Fort Bliss. What he didn’t mention was that toxic contaminants have been blamed for health problems at these locations. The Trump administration has not said exactly how many migrants it will place at each of these bases. However, the Pentagon has been told to prepare for up to 20,000 unaccompanied migrant minors and was asked earlier this week to prepare to house up to 12,000 additional migrant family members of all ages. One of the bases where these migrants will be sent, Fort Bliss, is a U.S. Army post in El Paso, Texas. It has reportedly been contaminated with radioactive waste, in addition to at least four different types of carcinogens. According to previously unreported court documents, The American Legion, the largest U.S. war veterans organization, was suing the V.A. as recently as 2008 on behalf of a veteran who developed a tumor after alleged exposure to Agent Orange and other caustic chemicals while at Fort Bliss. The veteran said he experienced direct skin exposure to Agent Orange, a powerful herbicide and defoliant, which he said had been spilled multiple times at the base. The V.A. 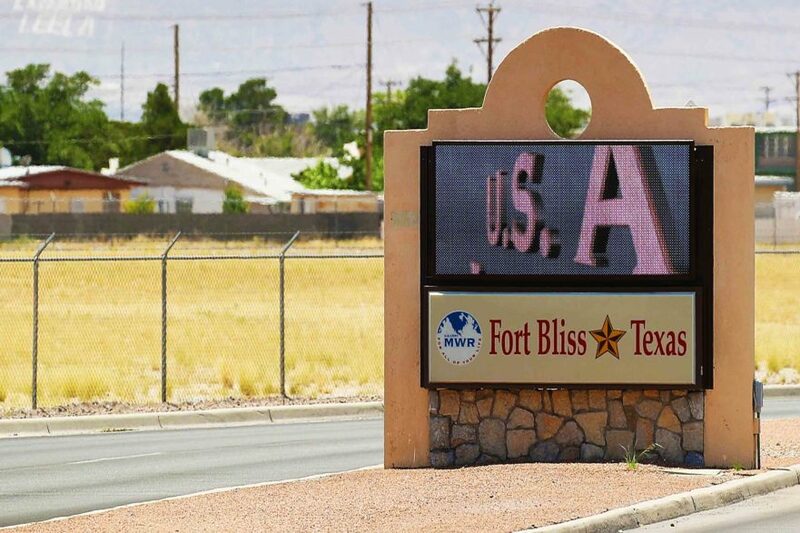 claimed there is insufficient evidence to connect the veteran’s cancer and his military service, but there is other evidence—including from the Army itself—that Fort Bliss does contain contaminants. Despite the Army’s lack of additional testing, there is evidence of other contaminants, aside from the nuclear waste. According to a report by the Environmental Working Group, Fort Bliss’s drinking water from 2010 through 2015 contained four different cancer-causing contaminants at levels exceeding federal drinking-water standards: radiological contaminants including both uranium and radium; chromium; dibromochloromethane; and trihalomethanes (TTHMs). The report, which drew on testing conducted by the EPA as well as the Texas Commission on Environmental Quality, also found 11 other contaminants. The water was deemed by the EPA as noncompliant in eight of the last 12 quarters. The Environmental Working Group’s report notes that the water was in EPA compliance from July to September of 2017, but does not say whether any contaminants were found after 2015. The other military base Mattis said would house migrant detainees, Goodfellow Air Force Base, is located in San Angelo, Texas, and is an intelligence training center for the Air Force as well as other service members. Goodfellow’s intelligence training specializes in signals intelligence (e.g., surveilling phone and text data). Despite the EPA’s decision not to disburse funds to remedy any contamination, Goodfellow continues to have environmental issues. In 2004–2005, the Environmental Working Group, a nonprofit that conducts research on environmental safety, found that Goodfellow’s drinking water contained TTHMs, a carcinogenic contaminant, above the legal limit, as well as 11 other contaminants. A 1988 Government Accountability Office report lists four different sites on the base as potential hazardous waste locations. The Mesothelioma Cancer Alliance also lists Goodfellow as posing a risk of asbestos exposure. A toxic foam was also used extensively at the airbase for firefighting. The foam has been linked to water contamination, cancer, and low birth weights. Despite the White House’s attempt, the study was published earlier this month. It found that military water supplies were far more contaminated than the government had previously acknowledged. Ken Klippenstein is a journalist who can be reached on Twitter @kenklippenstein or via email: [email protected]. This article betokens unintentional genocide possibly ( we hope not intended. ) Should not a judicial order be sought to halt this? OMG. I live in the region near Fort Bliss. I used to live in El Paso & brother was in the Army stationed at Fort Bliss. We had no idea the level of contamination out there. It’s especially scary because our local news hasn’t mentioned it in the approx. 12 years I’ve lived in this area! Furthermore, I can’t believe they’re going to house kids there. It’s so irresponsible to knowingly put kids near those toxins! Then again, I guess I can believe it. Disgusting.